ScriptGate is designed to allow for easy transfer of AGS and UScript files to and from your CMHC/MIS system so that you can edit them in your favorite text editor. 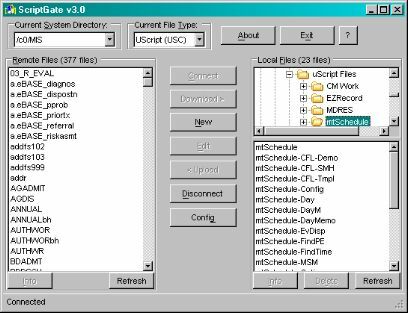 Using ScriptGate, it allows for access to multiple MIS system directories and picking of the local directory to store your files while you are working on them. ScriptGate also allows for full editing of AGS files and their headers as well as honoring the file lock them. No more having to deal with the F7 80 column headache! ScriptGate allows you to use any text editor you like, but we recommend UltraEdit from IDM Computer Solutions. You can review ScriptGate's help file here.